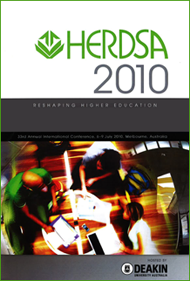 Academic practice and the purpose of higher education: What is the role of professional societies such as HERDSA? Arambewela, R. & Maringe, F.
What makes for a successful mentoring program for academics? Bell A. & Treleaven, L.
Bliuc, A., Goodyear, P. & Ellis, R.
Bolt, S. & Atkinson, D.
Bosanquet, A., Winchester-Seeto, T. & Rowe, A.
Bourne, R. & Kench, P.
Brown, N., Bower, M., Skalicky, J., Wood, L., Donovan, D., Loch, B., Bloom, W. & Joshi, N.
Bryant, D. & Zhang, F.
The diversification of Australian higher education: Is the academy prepared for the challenge? Carr, R., Hagel, P. & Hellier, P.
Cordiner, M. & Davis, L.
Diezmann, C. & Grieshaber, S.
Donovan R., Fleming. J. & Reaburn, P.
Fernando, M. & McLean, P.
Program design practice in a New Zealand polytechnic: Caught in a language trap? Grace, S. & Loftus, S.
Habel, C. & Habel, C.
Jackling, B. & Natoli, R.
Johnson, E., Maddox, L., Quinton, J. & Burke da Silva, K.
Jones, S., Applebee, A., Harvey, M. & Lefoe, G.
Karanicolas, S., Winning, T. & Snelling, C.
Generic skills: Do capstone courses deliver? Keller, S., Chan, C. & Parker, C.
Kelly, F., Russell, M. & Wallace, L.
Do collectivist cultures prepare students for teamwork? Lang, C. & Buzwell, S.
Mayson, S. & Schapper, J.
Mitchell, M., Zutshi, S. & Weaver, D.
Nausheen, M. & Richardson, P.W. Ngui, K.N., Hong, K.S., Gan, S.L., Usop, H.H. & Mustafa, R.
Owen, S.M., Stupans, I., Ryan, G., McKauge, L.M. & Woulfe, J.
Parris, M.A. & Saville, K.
Scutter, S., Wood, D. & Sim, J.
Singh, J.K.N., Schapper, J. & Mayson, S.
Velautham, L. & Picard, M.
Weaver, D. & Tucker, M.
Zeng, L.M. & Webster, B.J.